Seth Lundy of Roman Catholic dunks against Neumann-Goretti in the 3rd quarter at the Palestra on Feb. 22, 2017 in the Catholic League semi-finals. 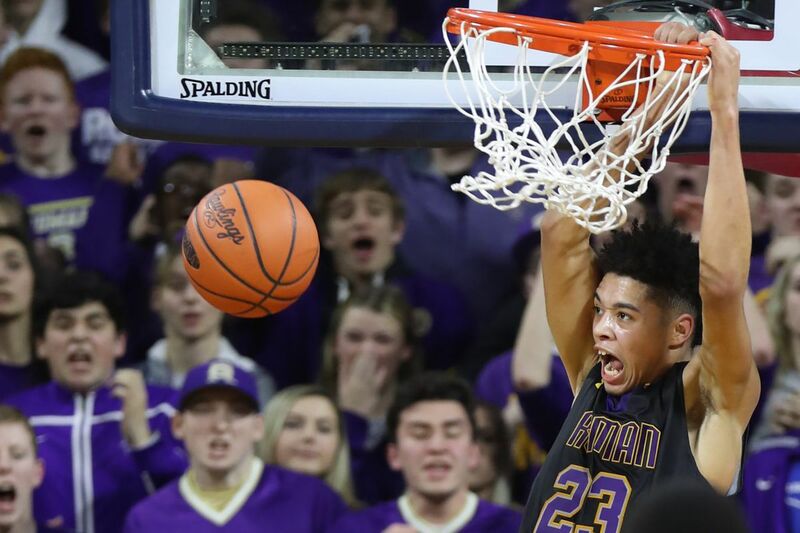 While Roman Catholic's Seth Lundy and Archbishop Wood's Andrew Funk were both terrific in a thrilling and back-and-forth Catholic League matchup, only one could walk away the winner. And with playoff positioning at stake, Lundy's 30 points, 13 rebounds, and three assists trumped Funk's line of 35 points, six boards, six assists, and two steals. Lundy and the Cahillites spoiled Wood's senior night and maintained its third-place position in the league standings with a heart-thumping, 75-73 victory Friday night in Warminster. "It was definitely a hostile environment," Lundy said. "We knew they were going to come out and try to win for their seniors." With his gritty play throughout and down-the-stretch resolve, Lundy showed why he has scholarship offers from the likes of Bowling Green, Connecticut, La Salle, Oregon, Penn State, Temple, Virgnia Commonwealth, Temple, and St. Joseph's. The 6-foot-6, 200-pound junior wing shot 12 for 20 from the field (3 for 4 from beyond the arc) and 3 for 3 from the line. He scored 10 points in the third quarter and nine in the fourth. "Seth Lundy is a warrior," Roman coach Matt Griffin said. "He's really fun to watch when he gets it going. Also, he's a high-character kid on and off the court." Roman, with its eighth consecutive victory, improved to 15-5 overall and 10-2 in the Catholic League; Wood slipped to 12-8 and 7-4 but remained in fifth place. After being held to six first-half markers on 2-for-9 shooting, Funk erupted in the third quarter. The 6-4 senior guard shot 6 for 6 from the field, including 2 for 2 from three-point range, and 3 for 3 from the line while scoring 17 points in that frame. In the fourth quarter, after Lundy's third trey of the night gave the Cahillites a 65-61 advantage, Funk, who is headed to Bucknell, immediately answered with a heave from the top of the arc. "He definitely had the hot hand in the second half," Lundy said. "We knew Funk and [Tyree] Pickron were going to shoot a lot for them. We just tried to make it as hard as possible for them to score." Roman's Lynn Greer III, an up-and-coming sophomore floor general, contributed 21 points, five boards, four steals, and four assists. Only four players scored for the visitors. Allen Betrand, a 6-5 senior guard and Towson signee, and 6-5 junior wing Hakim Hart each managed 12 points. Betrand, who sank two freebies to give the Cahillites a 75-71 edge with 43 seconds to go, added six boards; Hart posted seven boards and six assists. "I was pleased with our effort and toughness, but our execution has got to get better," Griffin said. Pickron, a 6-3 senior guard and Quinnipiac signee, drilled three first-half treys en route to 14 points; 6-5 junior forward Julius Phillips scored nine-first-half points; and 7-foot senior center Seth Pinkney managed six boards, four blocks, and four points. RC: Lynn Greer 21, Allen Betrand 12, Seth Lundy 30, Hakim Hart 12. AW: Rahsool Diggins 1, Tyree Pickron 14, Seth Pinkney 4, Julius Phillips 9, Andrew Funk 35, Andrew LaFond 6, Daeshon Shepherd 1, Kyle McNamee 3.